Last night I was tired from our Travels to Acadia and back to Bar Harbor. Molly the pup and I sacked out by 9:30pm, so I didn't get to write about the fun we had. Let's see if I can catch up on yesterday's adventures. 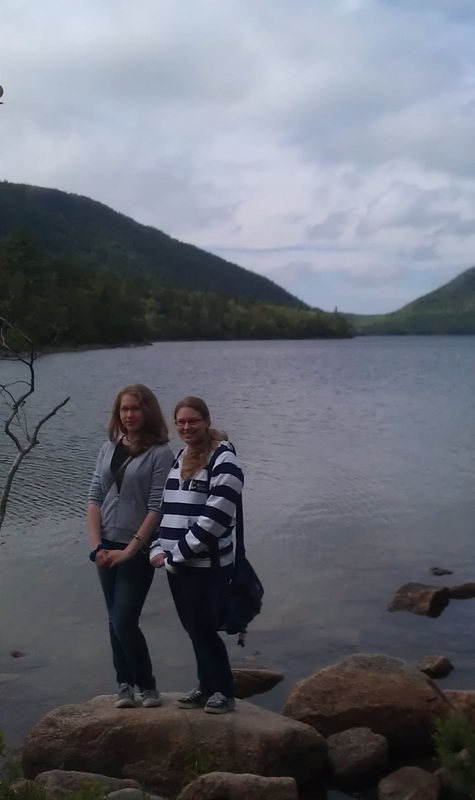 We headed out later than I would like (but perfect for the girls and beauty sleep) to tour Acadia yesterday. First, we stopped at the Ranger station, just a few minutes from our campsite. There we got our Park Pass for the car to enter Acadia. Not sure if before season, but it was only $10 when it's usually $20. 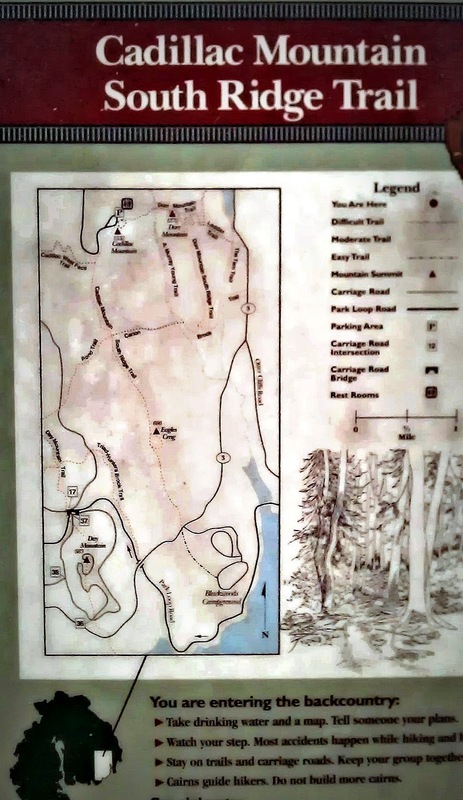 We entered Acadia Park a few miles before Bar Harbor, and followed the road to Cadillac Mountain, the highest point within 25 miles of a coastline on the U.S. East Coast. The road twisted and turned up the mountainside, and we had to watch for the sightseers and bicycle riders along the way. As we reached the summit, we could see parts were still shrouded in cloud, and mist blew across the parking area. The vegetation was mostly short, due to the cooler clime, thinner air, and the forceful winds. We walked the summit trail, a walkway the rings the topmost part of the mountain. Even though our heads were in the clouds, we still managed to get glimpses of Bar Harbor and it's islands below. Truly a beautiful place! After admiring the views, we stopped at the ranger station, bought some patches for our collection, and then headed back down. We continued on the road to Jordan Pond. Jordan pond is a large glacial lake, with visibility to up to forty feet in depth! The pond serves as the water source for Seal Harbor. At Jordan Pond, is the Jordan Pond House. Originally a farmhouse, it became a restaurant that members of "high society" in the late 1800's frequented. We indulged ourselves as they would have, having afternoon Tea, with Popovers. K and I also thought the seafood chowder sounded good, and had some as well. Everything was wonderful, seated on the lawn (with Molly the pup in tow) on wide benches and heavy tables, with a beautiful view of Jordan Pond, framed by the mountains. At this point, I'd like to mention that Bar Harbor, Acadia, and the whole of MDI is very dog friendly. As long as a pup is well behaved, I think they are able to go to many of the touristy areas. If there is outdoor seating, then the pup probably can go. 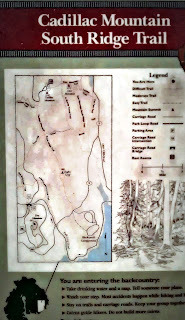 After our wonderful repast, we walked a trail ringing Jordan Pond, and then across one of the many Carriage Roads in the park. The carriage roads are similar in scale and build to Fairmount Park's Forbidden Drive, just seemingly more attended to with gravel and fill. After walking a bit, we again took to RoadToad and drove along the parks eastern side, stopping at beautiful Sand Beach (how people can dress that skimpy in cool weather, I just don't know) and to "Thunder Hole" Thunder hole is a crevass along the coastline that water enters into and whips back out with a large "thump" inside the stone. Standing beside, you can feel it within your body. We continued on after experiencing the "thunder" a few more times. We exited the park, after almost a full circle to Jordans Pond. 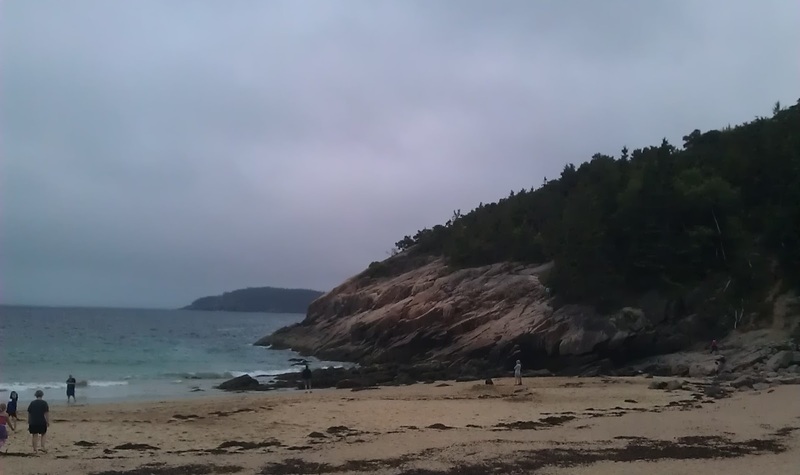 We headed to Bar Harbor, to experience walking out to Bar Island. Bar Island is probably 200 yards from Bar Harbor. 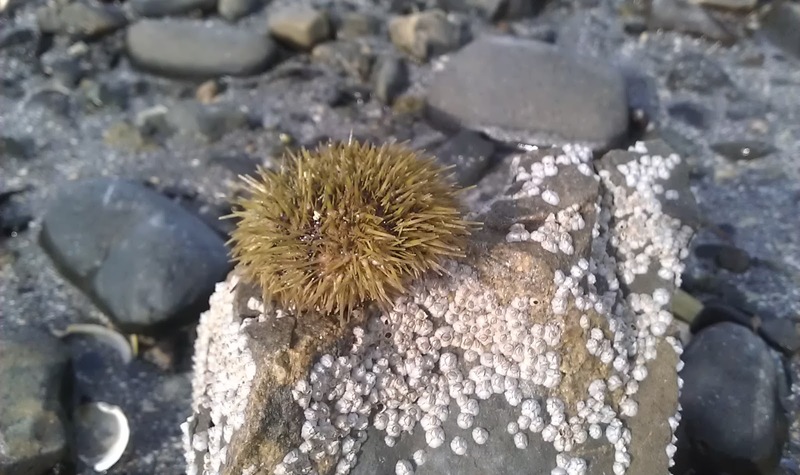 At low tide, it is accessible by a natural gravel shoal that even cars are able to drive onto. When we arrived at Bar Harbor, we parked near Bridge Street (aptly named), got on our sandals or flip-flops and walked to the shore. Regular shoes would have sufficed, as the water was drained off, and the path some fifty feet wide, was mostly just damp - and quite solid! Some parts there were pools still draining, and we found a sea urchin or two, and plenty of snails. We made the obligatory crossing to the island, took some photos, and walked back. Quite unique and quite touristy at the same time. We drove homeward to RoadAbode, made a stop for provisions, and had a dinner of Cincinnati style Chili - a comfort food dinner. Again a late start - but I didn't exactly get moving all that quick either. Had a great breakfast of Hashbrowns, bacon adn eggs, then off to the Oceanarium. We left Molly behind, as today is rather hot (in the low 80's) and figured a day in air conditioning rather than out in the hot marshland she might appreciate after traipsing about Acadia all day yesterday. The Oceanarium is right across the bridge, a mile or two away from our campground. It was interesting! We got to see mother lobsters ; baby lobsters, & the hatchery process. 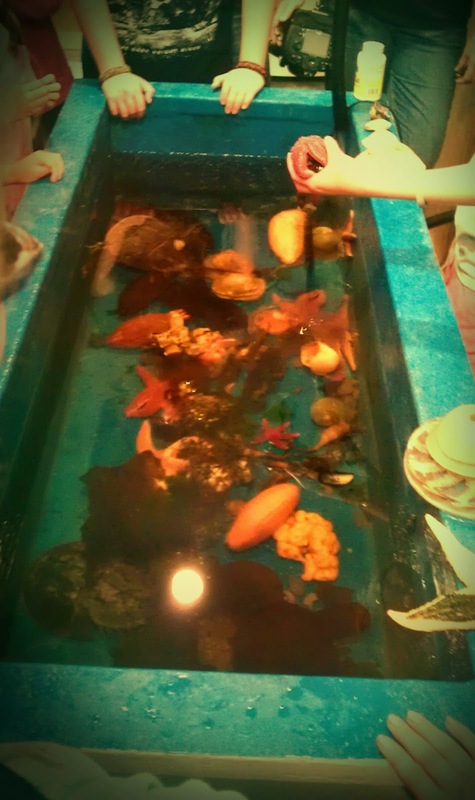 We also got a hands-on look with lots of local sea life, including sea stars, sea scallops, Sea Urchins, Sea Cucumbers, and Horseshoe Crabs. 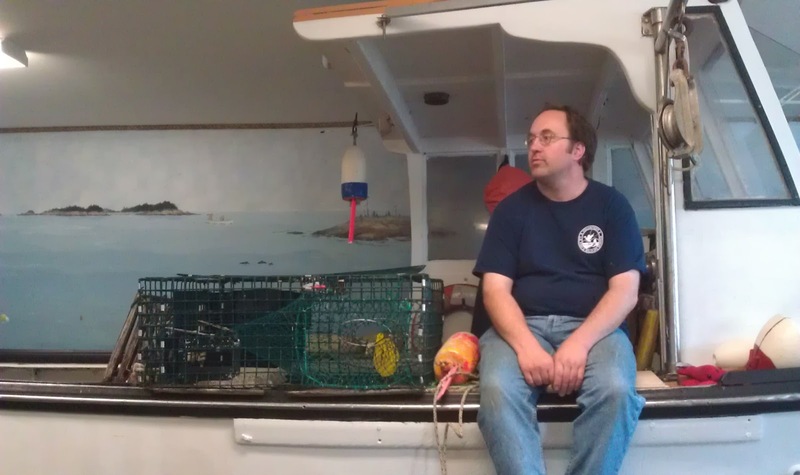 The other interesting part was talking with a local lobstermen, and learning about the Lobster traps and other tools. It was a neat insight to the way of life and how challenging lobstering can be. After our tours and education in all things lobster, we came back to relax at RoadAbode, enjoy the view of the "Narrows" and check in @ work. Girls headed to the pool and some reading. For me - typing here and watching the biplanes fly overhead for their tours follow the Narrows toward Bar Harbor. Tomorrow - On the Road to Salem MA.